Amid all the studio’s usual fairy tale adaptations comes a hilarious story about Kuzco (David Spade), a selfish emperor of a fictitious South American country who gets turned into a llama of all things in a botched assassination attempt by Yzma (Eartha Kitt), an envious advisor who wants to claim the throne herself. 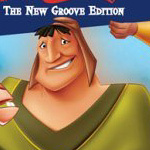 Kuzco can only be redeemed by Pacha (John Goodman), a good-natured peasant whose village Kuzco wants to demolish so he can install a new summer home. So it is not the most original of stories — no surprise from Disney — but the jokes more than make up for it. In fact, they make up the whole movie, which is stolen by Kronk, Yzma’s sidekick, who is adequately voiced by Patrick Warburton. These characters will go out of their way to comment on a weird plot twist, like why Yzma has a lever in her lab that drops her into an alligator pit; they’ll even talk back to the narration at times of despair. All this without getting too sentimental or talking down to the audience, especially the adults. The audio commentary is an example of too many cooks spoiling the meal with too many crew members talking too technical, and the less said about the music videos the better. But you can always count on Disney for producing a great picture and stereo sound, and “Groove” is no exception. The new edition is not as groovy as it would like to be, but the movie itself more than makes up for it.